The neutral language of technology masks the powerful influence algorithms have across the New Economy. 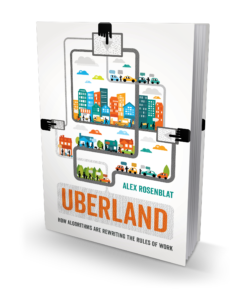 Uberland chronicles the stories of drivers in more than twenty-five cities in the United States and Canada over four years, shedding light on their working conditions and providing a window into how they feel behind the wheel. Uberland also explores the company’s outsized influence around the world: the billion-dollar company is now influencing everything from debates about sexual harassment and transportation regulations to racial equality campaigns and labor rights initiatives. Alex Rosenblat is a technology ethnographer. She works as a researcher and interdisciplinary scholar at the Data & Society Research Institute in New York City. Her most recent and prize-winning work is available in the International Journal of Communications, the Columbia Law Review, the Policy & Internet Journal, and Surveillance & Society. 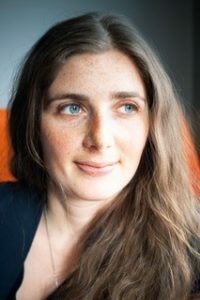 Her research is also featured in the New York Times, Wall Street Journal, MIT Technology Review, Vice, Quartz, WIRED, Time, Technology Review-Heise, New Scientist, the Guardian, and CTV. She is an occasional contributor to the Harvard Business Review, Fast Company, Motherboard, Slate, the Atlantic, and Pacific Standard.